It’s like Christmas in July, when the Canadian summer hits its high notes and I’m searching for ways to beat the heat, and the best gift happens to land in my mailbox. Hannah Kaminsky’s third book, Vegan a la Mode, is the perfect reason to break out my brand new ice cream maker and give it a test run—or three, or four. 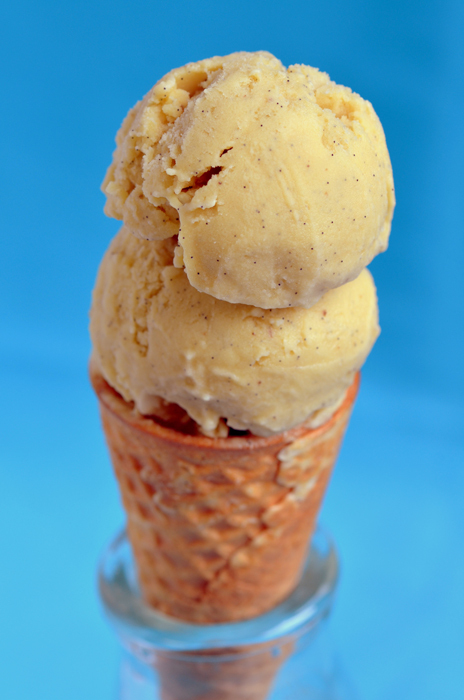 You guessed it: this book is all about vegan ice cream. Those who are turning to a lifestyle free of animal products won’t be disappointed by this fabulous collection of inventive, inspired flavour combinations, infinite ice cream base variations, and delightful toppings and accompaniments. But first, Hannah sets the stage for her recipe categories with a glossary of ingredients, recommendations for kitchen tools and toys, as well as a very helpful section on essential techniques (psst—you can make ice cream without a machine!) and troubleshooting to help us master the perfect ice cream at home. Here, Hannah proves her expertise—”Since the process of creating ice creams is so simple, attention to detail is key,” she says—but it’s in the creation of more than 100 recipes where she really shines. Trust me, there are no compromises on brilliant flavours here; they will lure you to taste a whole new world of possibilities. 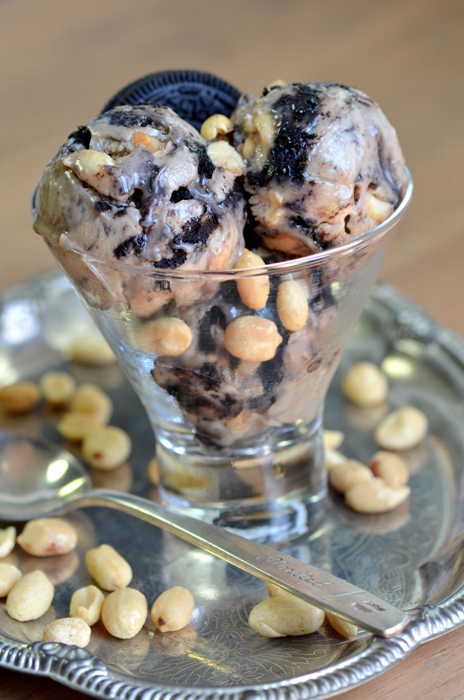 Since I love a combination of flavours and textures in my ice cream, I first gravitated toward Peanut Butter Bombshell, a rich frozen delight that is loaded with creamy peanut butter, chopped peanuts and peanut-butter filled cookies. Clearly, this is meant for peanut butter lovers only, but if you really can’t stand the sticky paste, Hannah suggests any other nut butter, along with standard vanilla creme-filled cookies, would make fine replacements. I personally couldn’t get enough of it. Equally high on my list of favourite flavours, mango and raspberry gelato is always on my must-have list when visiting an ice cream shop. 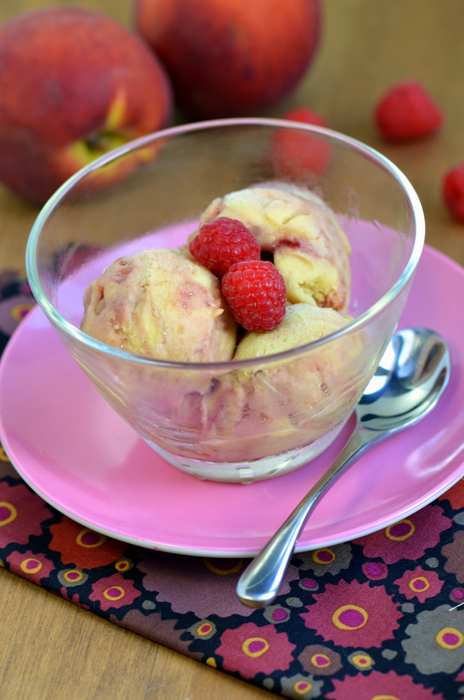 Similar in flavour, this Peach Melba ice cream really rocked my world. Made with fresh peaches and coconut milk and with a swirl of seedless raspberry jam throughout, I was in heaven upon first bite. Despite Hannah’s reputation for creative risk-taking in the recipe department, she did include a few basics for the less adventurous (like my hubby, who requested this particular treat). It turns out, after centuries of ice cream consumption, Vanilla is still firmly situated at the top of the list, outselling chocolate two to one. Hannah’s take on this classic is pretty simple—high-quality vanilla beans and custard powder—but the results are pretty incredible. Finally, the German Chocolate won over a crowd of dairy lovers at a recent family gathering. 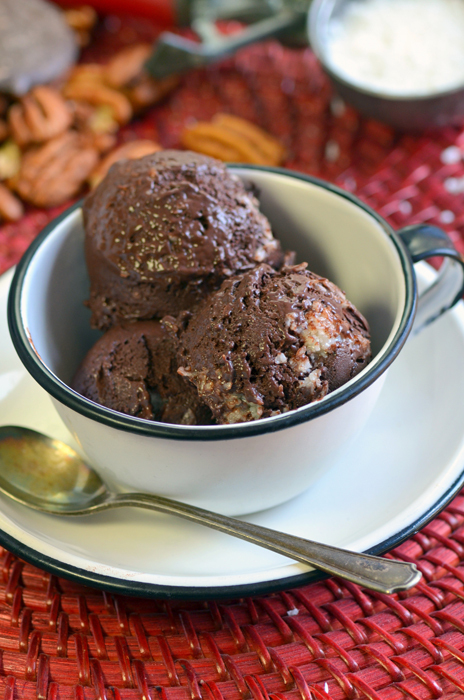 This intense, decadent concoction is a marbled beauty of chocolate ice cream base that is swirled through and through with sweet coconut flakes and pecans, much like the filling found in German chocolate cake. Who knew you could make ice cream out of a cake flavour? In this case, I’d much rather have the ice cream. Because this final flavour swooned so many of my testers, I got permission from Skyhorse Publishing to share the recipe with you. If you enjoy it as much as we did, buy the book! I promise you won’t be disappointed. Hannah says: "Go ahead and really layer the coconut in for this ice cream—it's hard to imagine ending up with 'too much,' even if it looks like a lot compared to the ice cream base." To make the chocolate ice cream, begin by combining the cocoa, sugar, arrowroot powder, coffee powder, salt, and cinnamon in a medium saucepan. While whisking continuously, slowly pour in the nondairy milk, and beat vigorously until there are no more lumps. Turn on the heat to medium and bring the mixture just to a boil, stirring gently the whole time to prevent the solids from settling on the bottom of the pot and burning. Remove from the heat and let cool for a few minutes. Place the vanilla and tofu in your blender or food processor and thoroughly puree, scraping down the sides of the bowl as necessary. Once smooth, add in the melted chocolate, followed by the cooked chocolate custard, and pulse until the mixture is well blended and homogeneous. Chill thoroughly in the refrigerator. For the coconut swirl, combine the nondairy milk, arrowroot powder, and sugar together in a small saucepan over medium heat, making sure to get out all the lumps. Cook just until bubbles begin to break on the surface; then turn off the heat. Quickly stir in the margarine so that it melts, followed by the vanilla, coconut, and pecans. Let cool while you begin to churn the ice cream in your ice cream maker according to the manufacturer's instructions. 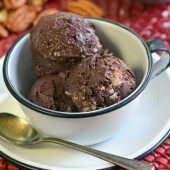 Transfer the soft ice cream into an airtight container, layering scoops of ice cream with spoonfuls of the coconut swirl. Let it rest in the freezer for at least three hours before serving, until solid enough to scoop. Republished with permission from Skyhorse Publishing.